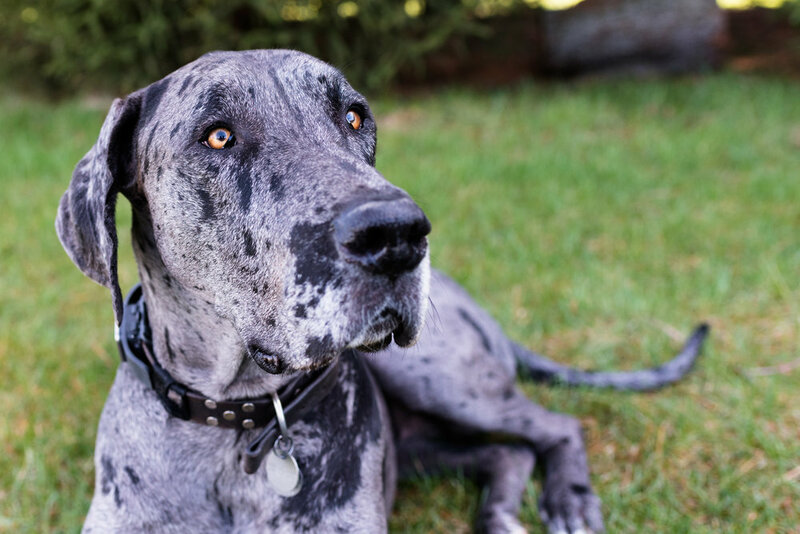 Teague is a three year old Great Dane. His lovely owner, Julie, offered to bring him to our group photo shoot a couple of weekends ago. I had asked for a dog to "model" for us on that day in order to practice some pet photography. Teague fit the bill perfectly! Not only is he handsome, but he is very sweet and a perfect gentleman with people! I had only met two Great Danes before Teague and neither of them were full grown. I love big dogs, but I think it is safe to say that Teague is the biggest dog I have met! Once you meet him though, his size quickly becomes less and less intimidating. He was curious and wanted to meet everyone and explore the property. Teague has the most interesting colors and spots on his coat! And his big, beautiful golden eyes! It was truly a pleasure to get to hang out with such a beautiful animal. Teague did not love sitting still because he was more interested in being close to the people or smelling the new things in the yard, but we managed to get a couple still moments out of him! Keep scrolling for more of Teague and his cute face! If you would like to get more details on booking a session like this one, please fill out this contact form!